The Angell Blackfriars Theatre is a state of the art proscenium/modified thrust theatre located in the Smith Center for the Arts which opened in 2005. The Angell Blackfriars is home to the main stage series of plays, musicals and dance concerts produced annually by the Department of Theatre, Dance & Film. Thrust portion of stage is 19′ from opening to down stage edge and 12” below proscenium floor. The thrust is comprised of a Wengar pit filler 32’ wide at the proscenium line and 17’ wide at the down stage end. 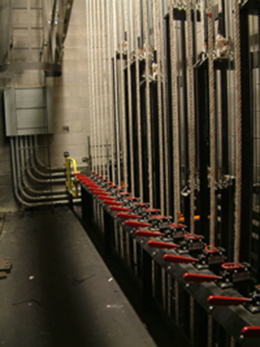 (21) fly lines on 9” centers and 48’ wide are operated manually from stage floor and/or from gallery stage left. Lines #4, #11, and #18 dedicated electrics. Flexible opening revealed by removal of Wenger pit filler system floor panels. Pit floor is 11’ below the proscenium stage floor. 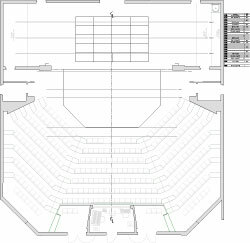 (20) 3’ by 6’ Traps upstage of the proscenium forming a total area of 15’ up to down stage by 24’ stage left to right to a depth of 11’ below the stage floor surface. (6) Black Velour Legs – sewn flat. 22″ H x 10″ W. sewn flat. (3) Black Velour Borders 6′ H x 48′ W. sewn flat. (1) Black velour drape 22’ H x 48’ W. sewn flat. (1) Black scrim 22’ W by 48’ W.
(4) 19′ H x 4′ W side masking drapes hung on track from gallery with capability of masking from proscenium to upstage wall. two between catwalk #4 and #3 and two between catwalk #3 and #2. (3) Dedicated electric pipes on stage. (1) Dead hung pipe 8” down stage of the proscenium arch at 21’ from the stage floor. (4) 6 dimmer fanouts, one located on each catwalk. (18) dimmers on each of three on-stage electric fly lines. Full tracking back-up system for Expression 3 console. (17) hard wired DMX inputs located throughout the catwalks and stage house. (20) 1000W 3 Cell Altman Econo-Cyc. (1) 24 channel Yamaha M2500 house mixer for body microphone control.